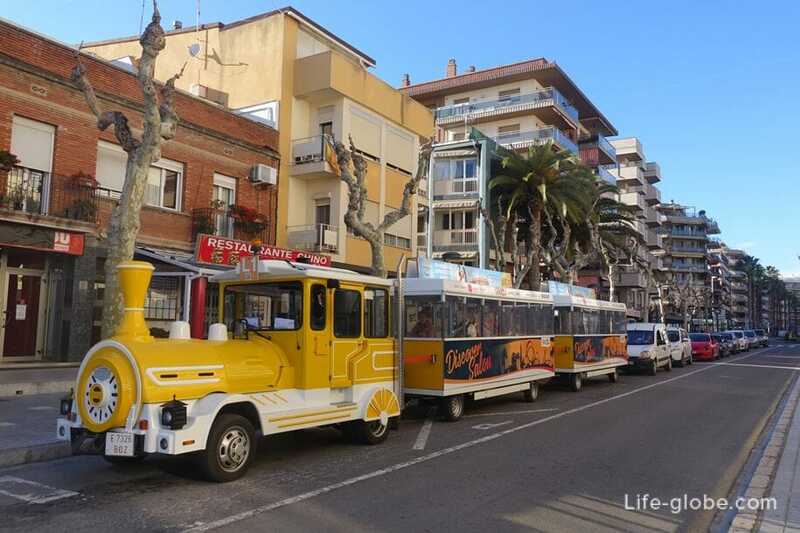 Tourist Train in Salou - bright small train that runs in Salou, created with the aim of exploring the main attractions, beaches and promenades of the resort. In the cabin of the train wooden benches. In the high tourist season, empty seats in almost, sometimes, not find. For who will approach a tourist train Salou? For those who do not want to walk, families with small children and just anyone who wants to ride around town on this bright train. Also the trip on the train may be the way to reach the famous amusement Park Port Aventura. The train operates on two routes of the tourist lines (tren turístico) L1 and L2. Both routes are circular so you can begin your journey at any of the stops. Also both routes pass through Port Aventura. During the trip you will be accompanied by an individual audio guide. Each of the trains makes stops near the main attractions of the route. You can enter and go at any stop. Train following this route gives you the opportunity to explore the centre of Salou and two Central beach: Llevant and Ponent. - stop Miramar, near where you can see the old tower (Torre Vella de Salou), the old locomotive and the town's main Church, the Church of Saint Maria del Mar. Then, following along the promenade of Ponent beach, the train once again to the square of Venus, where it turns around and drives back. This route runs through the Eastern end of the beach is the Llevant and around the area of Cap Salou. - next train should be back towards the center. Stop on the Europe square (Plaça Europa), and again in a circle. The yellow route line L1 (stop at numbers: 1, 2, 3, 4, 5, 9, 10, Port Aventura, 11, 12) . 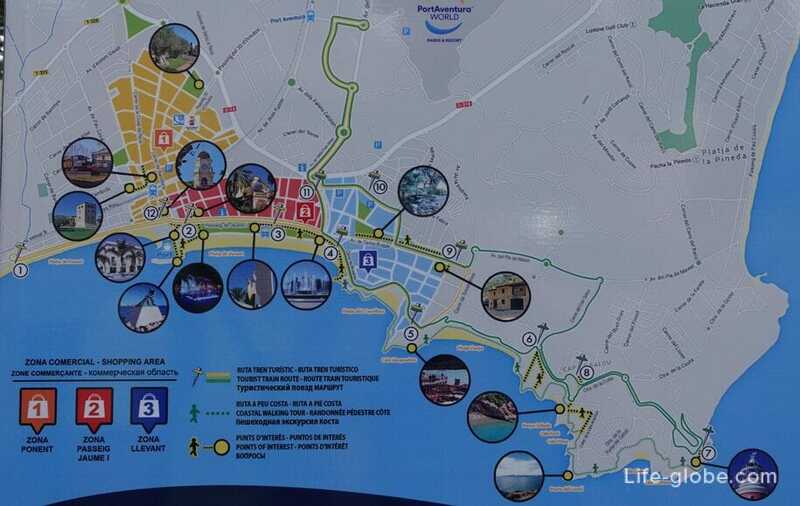 The green route - the line L2 (stops are numbered: 4, 5, 6, 7, 8, 9, 10, Port Aventura 11). Children 3-14 and seniors over 65 years - 4€. Family ticket (2 adults + 1 child) - 15€; extra charge of 3€ for each subsequent child. Watch the movement of tourist trains in Salou depend on the season, the cost may also change. To see the exact timetable and ticket prices here.